The word "Zang" is actually a short form for "Xi Zang", which means Tibet. 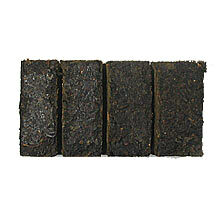 Black brick tea has a long history in Tibetan culture and is an indispensable part of their diet. Drinking brick tea is known to help Tibetans keep their body warm, aid digestion, cleanse the body of accumulated lactic acid, rejuvenate inner strength and increase stamina. A Tibetan can fall sick in a matter of days without it. Our Zang Zhuan Cha is compressed using tea leaves that have been aged for at least two years. A pungent, woody, strong and full-bodied character makes this a good wake-me-up tea. Woody aftertaste lingers on after a few sips. Avoid overbrewing as this tea can be very pungent if you are not careful. Zang Zhuan Cha is also the perfect ingredient for making Tibetan Milk Tea. The Chinese writings "Yi Shou Yan Nian" is written on the yellow wrapper. It means “to lengthen one's life”. The compressed brick tea is comprised of four segments, making it easier to break and use.